Dr. Molly Moreland received her D.D.S. from the University of Iowa College of Dentistry in 1991. 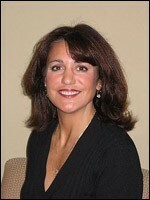 She opened her Iowa City practice right after graduation and moved into her current facility in 1997. She was awarded Fellowship in The Academy of General Dentistry in 2002 and has studied extensively at the Dawson Center for Advanced Dentistry in St. Petersburg, Florida. She was honored as one of the "Best Dentists in America", following an extensive peer-review survey of many of the top dentists in the U.S. in 2005. Dr. Moreland maintains membership in: The American Dental Association, Academy of General Dentistry, American Academy of Facial Esthetics and the Spear* Education Study Club. Molly has served the Iowa City community as a member of the Johnson County and Iowa State Cancer Society Boards, The Alumni Board of the University of Iowa as well as The Board in Control of Athletics. She was instrumental in helping start the Iowa City Free Dental Clinic and has volunteered her time to the free mouthguard program sponsored by the Johnson County Dental Society. When not in the office, Dr. Molly enjoys running , working out and following Iowa Hawkeye athletics. She and husband, Jim, have two grown daughters.